With the school year in full swing, ‘Mom‘ is always on the lookout for nutritious, wholesome foods for the entire family to provide everyone with the energy they need throughout the day! 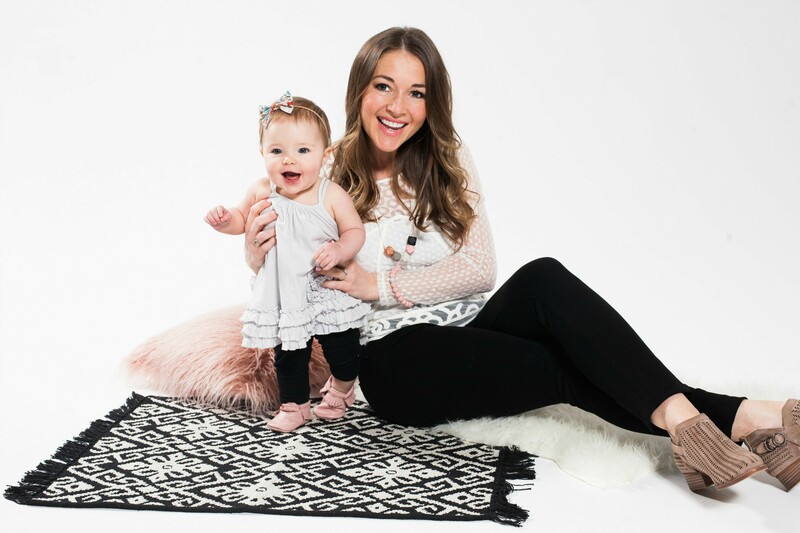 Stepping up to the plate in a big way is one of ‘Mom’s’ new favorite companies – Orgain! From delicious plant-based protein bars to organic almond milk and Vegan nutritional shakes, Orgain offers a wide variety of options for today’s busy, but health-conscious families! Orgain was created by Dr. Andrew Abraham, whose own experience seeking high-quality organic nutrition during his cancer treatment years ago inspired him to develop organic products for active families in need of great-tasting, wholesome options on-the-go. One lucky winner on Tiny Green Mom will win the Orgain ‘Back to School Survival Kit,’ filled with delicious protein-packed products for the whole family! From September 24th – September 30th, you can enter to win daily on Tiny Green Mom! 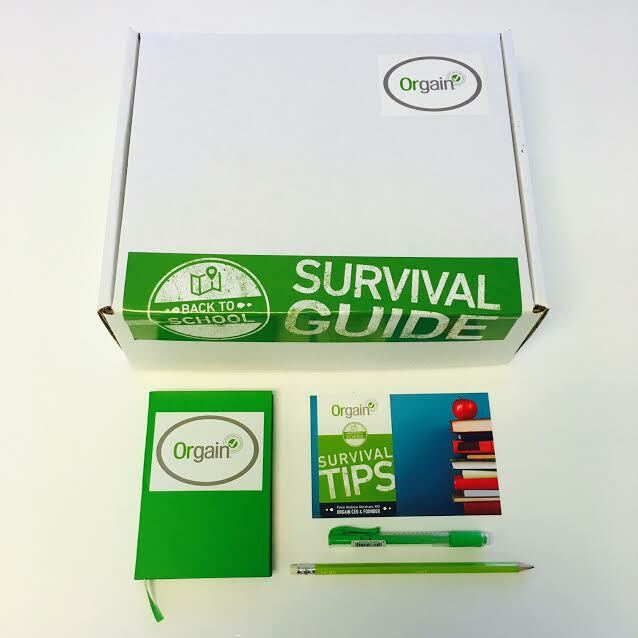 First, leave a comment below to let us know why you would love to win the Orgain ‘Back to School Survival Kit’ Giveaway! Visit Orgain on Facebook. Please leave a comment below to let us know you have stopped by their page to learn something new! This is only valid for one entry. Follow Orgain on Twitter. Leave a comment with your Twitter name to let us know that this has been done. This is only valid for one entry. 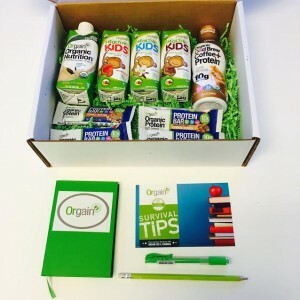 The Orgain ‘Back to School Survival Kit’ Giveaway ends on September 30th, 2016 and is open to the US only. Please leave your email address in each comment, and make sure to leave a separate comment for every each and every entry that you make so that they will count for you! This Labor Day weekend, use the last of those deliciously ripe, juicy summer peaches by pairing them with jerk chicken on skewers for a fuss-free meal with family & friends that goes way beyond grilled chicken! 1 Prep: Wash and dry all produce. Preheat the broiler to high or oven to 500 degrees. If you want to use the grill, fire it up to high. Soak the skewers in water. Halve, peel, and finely dice half the onion. Cut the other half into 1-inch cubes for the skewers. Trim and cut the snap peas into ½-inch pieces. Halve, pit, and slice the peach into wedges. Cut the chicken into 1-inch pieces. 2 Make the pilaf: Heat a drizzle of oil in a medium pot over medium heat. Add the diced onion and cook, tossing, for 3-4 minutes, until softened. Add the rice and ½ teaspoon curry powder. Toss to combine. Add 1 cup water and the chicken stock concentrate. Bring to a boil. Cover and reduce to a simmer for about 15 minutes, until it is tender. During the last 5 minutes of cooking, stir the snap peas into the rice. Season with salt and pepper. 3 Marinate the chicken: Toss the chicken in a medium bowl with the jerk seasoning, peaches, onion cubes, and a drizzle of oil. Season generously with salt and pepper. 4 Broil the skewers: Thread the chicken, onion, and peach wedges onto the skewers, alternating between each. Place onto a foil-lined baking sheet. Broil 10-12 minutes, turning once, until cooked through and lightly charred. You can also cook the skewers on the grill. 5 Finish and serve: Cut the lemon into wedges. 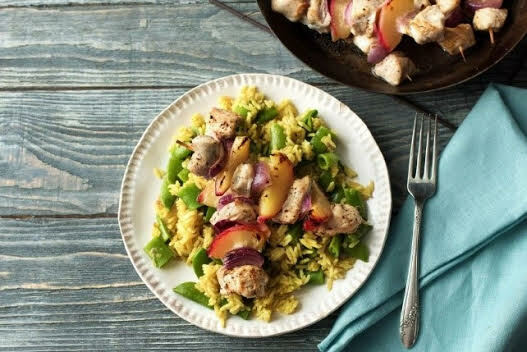 Serve the jerk chicken skewers on a bed of curried rice pilaf. Squeeze over a lemon wedge and enjoy! 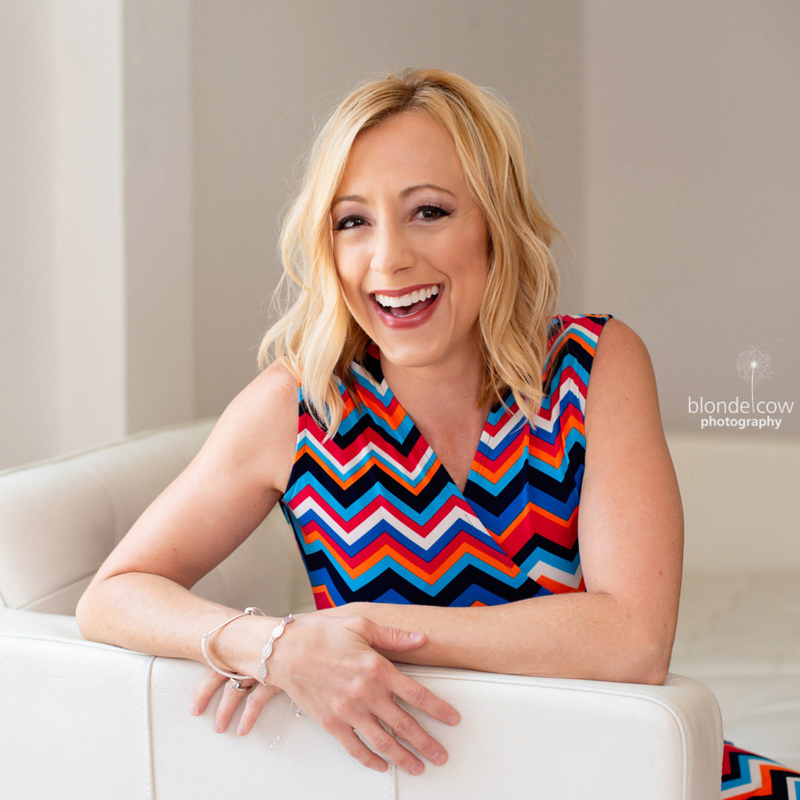 At Tiny Green Mom, we love finding new + innovative companies that really ‘get’ what modern mommas need and desire! For “Mom,” who has a teething 7 month old, this means finding baby safe jewelry that her little one can drool and chew on without worry, and that looks fashionable, too! With geometric shapes and beautiful color combinations that come together like a gorgeous piece of art you can actually wear, the stunning Mama & Little collection will have you dreaming up outfits you can rock with baby in tow! “Mom” adores the delicate Teresa Silicone Teething Necklace in “Mermaid” above – isn’t it pretty?! 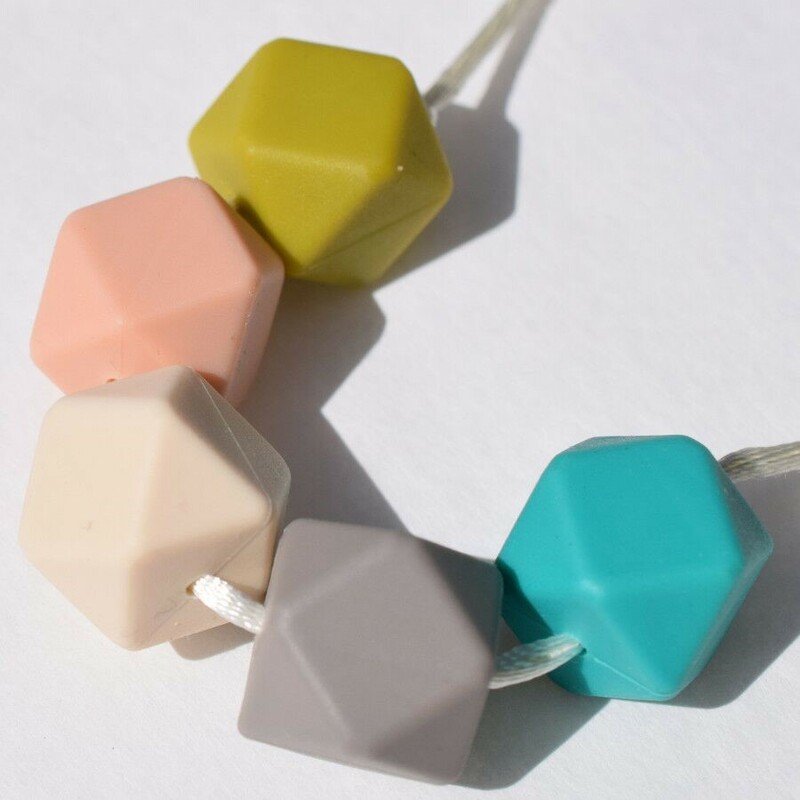 Featuring a breakaway safety clasp and made from 100% silicone beads, this gorgeous necklace can be easily cleaned with soap and water after your sweet baby plays it with and chomps on it. It will keep little fingers occupied without compromising your style, and we love that it is non-toxic, as well as BPA, PVC, phthalate, latex, lead, and cadmium free! 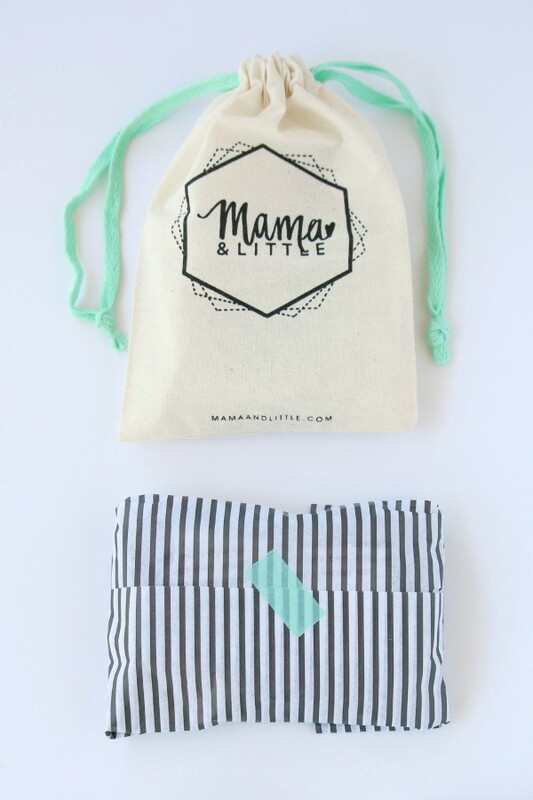 When you order a teething bracelet or necklace from Mama & Little, your jewelry arrives packaged beautifully in a cotton drawstring bag. Whether as a gift for yourself (it’s ok – treat yourself! You deserve it, moms!) 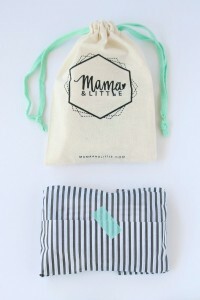 or for someone who is expecting, Mama & Little will be a treasured gift! To learn more about Mama & Little and the entire collection of teething jewelry, visit the Mama & Little website.